It was a great experience. She was knowledgeable, and gentle. She explained everything and answered my questions clearlyand concisely. It was a great experience. She was knowledgeable, and gentle. She explained everything and answered my questions clearly and concisely. It was such a great visit! Dr. McKnight was very pleasant and enthusiastic about her work. I was a new patientand it was if I had been her patient for years. It was such a great visit! Dr. McKnight was very pleasant and enthusiastic about her work. I was a new patient and it was if I had been her patient foryears. If you are experiencing shortness of breath, chest pain or any other emergency, please call 911. 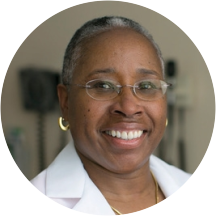 Alice McKnight, M.D., is a native Washingtonian, who joined the practice in 1990. She attended medical school at The Medical College of Pennsylvania and completed her residency training at Howard University in 1986. She practiced at The Magee Women’s Hospital in Pittsburgh, PA and at a public health facility in Alexandria, VA, prior to joining the practice, which enables her to gain a great deal of experience in various gynecology, gynecologic infectious diseases, and laparoscopic and laser procedures. Dr. McKnight is Board certified by the American Board of Obstetrics and Gynecology and is a member of the Old Dominion Medical Society. Loved it! Very nice facility and very professional visit. She was amazing. I will be seeing her again. I wish I'd seen her before I had kids! A little aggressive on the pap smear, but absolutely lovely and personable. Dr. McKnight and the office staff were wonderful, professional, and made it easy to feel comfortable. Very positive atmosphere. No wait and knowledgeable personnel. I am very impressed with Dr. McKnight. She exudes warmth and professionalism. Her office staff were also excellent. I feel confident in her abilities and delighted to be in her care. Dr. McKnight is a kind and knowledgeable provider. She shows great care during my appointment and didn’t rush our time. I'm still going. No reason not to. Awesome great Lister really take good care of her patients. Dr. McKnight was wonderful. She was fast, friendly and welcoming. Dr. McKnight was extremely kind and genuine. This was my first time visiting her and I felt very comfortable. I am a young woman who came in for her annual exam and was quick and to the point with little tono wait time! Everyone was very friendly and knowledgeable. Great first visit, I highly recommend! Dr. McKnight is warm and welcoming and so is her staff. This is my second visit with her and I feel she is providing excellent care. I'm so impressed by the professionals at Dr. McKnight's office. Highly recommended for any and everyone in need of an OBGYN. I'm pretty sure I'd travel long distance just to come time this office!! She was considerate of my feelings and was extremely kind and calming through the entire process. I will definitely come back and recommend to friends. This was my first visit with Dr. McKnight. Everything went well. She seemed very knowledgeable about my issues. I will most likely continue health care with her. Knowledgeable, congenial, thorough! Great Dr. and staff. I am very pleased with Dr. McKnight's office. Will continue to see her. Staff was great. She’s great, fast and made me feel very comfortable. She is awesome, you can tell she really cared about making sure I received the best care. Great bedside manner and an easy appointment. Also got my results in a reasonable amount of time, which reflects well on the office! I was a new patient so it took a little longer than normal, however, I was done with my appointment within an hour. I would recommend Dr. McKnight. She took the time to listen to my concerns and treated me with respect. This was my first visit but I felt very comfortable with Dr. McKnight. She was quick but thorough, nice and have sufficient info. The whole staff for Dr. McKnight were great. Warm, friendly, and called me by my first name. Answered all my questions and were open and thoughtful when answering or explaining. Didn't need to go offsite for blood testing either; it was taken right in the office. Dr. McKnight was very professional and comfortable to be around. She took her time to explain things to me in a manner I could understand. Simply put...she's amazing! She takes her time, listen to my concerns and responded to all my questions. Very knowledgeable. Made me feel real comfortable and confident about my visit. Alice was very friendly and quick! She made me feel very comfortable and asked me multiple questions. I highly recommend! Dr. McKnight is very welcoming and attentive. Efficient would be the best word to describe my appointment. The receptionist greeted me and was prepared with paperwork, I was taken in at my appointment time, the nurse was expedient and so was the doctor. I can see how somepeople might be put off and call this uncaring, but the doctor did not seem hurried or annoyed when I discussed some concerns with her so I did not find it rude, and appreciated the timeliness. This was my first and my last visit with Dr. McKnight. The wait was long and the visit was very rushed. She did not take a single moment to ask me my concerns or even questions about my history (that wereindicated on the new patient form). I was very shocked, especially being that I was a new patient. She literally walked into the room (I was sitting on the examination bed, backing her) and placed a stethoscope on my back before I even I had the chance to say hello. She proceeded to do a breast exam then a pap and left. It was disappointing, after going through so much to book an appointment with her. I felt like a lot was missing. The appointment was ran like a strict business meeting. Never again. She was very vague in explaining things to me. I felt like she did not listen to what I had to say. I was having a birth control conversation and she did not really talk me through the options. She providedone option and was not very detailed when explaining it. She was very nice and informative.. I came in for my yearly but had some questions about having another baby, the nurse before me said I may need to schedule another appointment for that however, when Dr. Mcknight came in shestill took 10 minutes of her time to talk to me about all my concerns and even provide some recommendations. I think I've found my new ob/gyn, she was amazing and gentle too! Besides I had to wait for an hour and 10 minutes, overall expensive was good. The staff were nice, and Dr. McKnight was friendly and patient to listen to what I had to say. She was fantastic! Friendly right off the bat which immediately put me at ease. She was informative yet gently. Really cool vibes and will def come back to her practice. Dr.McKnight is amazing. She is personable, thoughtful, and warm and welcoming. I love that she is a black woman OBGYN. I wish I had discovered her years ago. Everytime I go there it is a great experience. Dr. McKnight is amazing! Her bedside manner is outstanding, she's very personable & I enjoy all of our encounters. I am fairly new to doing this on my own. Dr. McKnight was amazing as was her staff. I felt very comfortable and every question I had (there were many) was answered in full detail. Dr. McKnight herself was also very fun and personable. One of the ladies who checks you in clearly need a attitude adjustment. She is/was my 1st impression of the office and if I had to go on her alone I would not return. However the nurses and the doctor wasreally good and made up for her unprofessional attuned.